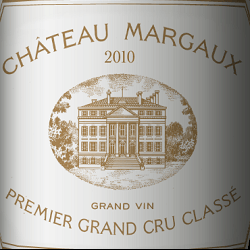 Chateau Margaux 2007 Bordeaux wine. 1er Cru Classe. This is the most complete and luxurious 2007 Bordeaux I tasted so far. Ripe cassis and a perfect dose of toasted oak. Silky tannin, but with more than enough power. Complex and a lot of finesse. The Wine Advocate 92 points, drink 2017 - 2035, The elegant 2007 Chateau Margaux’s purity, depth of fruit, and overall equilibrium are impressive. A dark ruby/purple color is accompanied by notes of spring flowers, black currants, and blackberries, a soft, lush, medium to full-bodied mouthfeel, and delicacy allied to impressive depth, texture, and length. Margauxs historic success was largely due to one dedicated dynasty, featuring such family names as Lestonnac, de Fumel, Hargicourt, even the Pontacs of Haut-Brion were involved by marriage. Between the 16th and late 18th centuries, and betimes helped by talented estate manager M. Berlon, the family steadily improved the wines quality and saw its reputation extend across the Atlantic. The French Revolution brought that era to an abrupt end (the guillotine again!) and in 1801 Margaux belonged to Bertrand Douat, Marquis de la Colonilla, who added the château, cellars and cooperage. Later owners battled against the usual hazards (vine disease, war, recession), but in 1950 the Ginestet family revived the outlook. Progress has continued under André Mentzelopoulos, who since 1977 has invested massively. His daughter Corinne is today in charge.